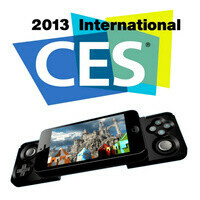 We saw more than a few new smartphones, tablets, and Android-powered toasters on display at CES 2013. Some of them we liked, others we weren't so crazy about. But in addition to all of these devices, plenty of manufacturers attending the show had brought all sorts of accessories as well, and we've picked some of the more interesting of them just for you, guys. Which one of them you think is the coolest? Would you ever consider getting any of them once they hit the market? Let us know down in the comments! The Zoom iQ5 turns your iPhone 5, iPad mini, or 4-th generation iPad into a professional handheld sound recorder. Equipped with stereo microphones, it can capture uncompressed, 16-bit 44.1kHz audio for your high-fidelity applications, although you should be able to use it while capturing video as well. The accessory should go on sale in Q2 of this year and will cost about $100. Here's an accessory that kids will surely love to play with. The Crayola Light Marker, priced at $30, uses some high-tech wizardry to turn sketches drawn in mid-air into real digital images. The trick lies in the device itself, which emits a light that the iPad's front-facing camera tracks. A dedicated application turns motion into brush strokes in a color of the user's choice. Have you ever lost a phone? Many people have, so Kensington came up with a solution. The Proximo will start beeping whenever your iPhone isn't nearby, and the Proximo Starter Kit (priced at $60) includes additional tags that can be attached to other things you never want to lose track of. And speaking of tracking stuff, here's Trakdot. It is a battery-operated gadget meant to go inside your suitcase or backpack. It lets you keep track of your luggage with the use of dedicated smartphone app. Trakdot will be available in April and its makers assure us that it is okay to use it when traveling by plane. Although there's no shortage of gaming accessories for the iPhone, adding another one to the list won't hurt. Here's the iFrogz Caliber Advantage with its D-pad, six action buttons and dual analog sticks. It should hit the market later this year for a price of $70. As the title suggests, this gizmo lets you monitor a baby remotely while he or she is napping. What's really cool about the Philips In.Sight B120, however, is that it works with an iOS app, meaning that you can watch the video stream on an iPhone or iPad. The video comes in HD quality and there's built'in night vision as well. Here comes one more iOS accessory by Philips, this time tailored for the needs of grown-ups. The Party Machine is like a stereo with a built-in DJ booth, allowing you to pop-in an iPhone or iPod and start a mix using music from both devices. It should be released later in January for a price of $350. In case you have $200 lying around and you feel like spending them on an iPad case, check out the Belkin Thunderstorm. It offers not only protection for the tablet, but also a pair of speakers and a stand, thus making the movies and music you play a lot more enjoyable. For $160 you can have Lockitron, which is a device allowing one to lock their doors using a dedicated smartphone app. And since the gizmo works over the internet, you have control over it from virtually anywhere in the world. Keep in mind that although the Lockitron won't ship until May, pre-orders are now open and prices have been slashed for a limited time. The guys at Rokform are known for their tough iPhone cases, but at CES they showed off an iPhone stand as well. Behold the RokDock - a 3 pound chunk of solid aircraft grade aluminum. At $100, it definitely isn't cheap, but gadget lovers might dig its solid construction and tough looks. Should have said apple accessories instead of just accessories. Yeah, this is lame. The event isn't called iCES. Where are the Android stuff? Why didn't anyone make or mention android accessories?